The first June weekend brought us a few big wins. At Hoosier Park on Saturday, June 2, the two older pacers we suggested completed the exacta, worth $101.80. Rockincam won the Dan Patch, paying $23.20, with Special T Rocks completing the exotic. If you added Atochia, the horse we suggested in last week’s Molson Pace, you had the triple, worth over $1,200. At Yonkers on June 2, we stayed with last week’s choice from the New Jersey Sires Stakes, Pet Rock, in the Art Rooney Memorial Pace for glamour-boy pacers. Pet Rock paid $10, beating the favorite, who finished second, and completing a $22.40 exacta. Those are great prices for a six-horse field. Friday’s Pennsylvania Sires Stakes delivered Bakin On The Beach second at 10-1 at the Meadows, while we won with our pass, Sweet Lou (see new below). Also on Saturday, Thinking Out Loud turned out to be the favorite in one of the divisions of the Somebeachsomewhere, finishing second. Our Hambletonian Trail blog previews Trail races and reviews Trail races, check it and the Hambletonian Society site. At Cal Expo, the no-takeout Pick 4 on June 1 only paid $144 and included two of the horses we gave you in our weekly preview blog. In the second leg we had Gentle Dragon, $12, and in the final leg we had Paul The Powerful, $6.60. 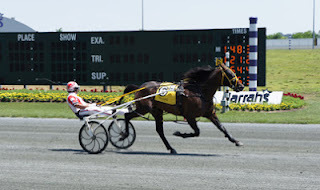 Connect to Twitter and follow Frank and Ray Cotolo for up-to-the-minute suggestions on wagers at many harness raceways. Then, wager from TwinSpires. From May 27 through June 2, here are the winners tweeted just before their race times: Royal Cee Cee N, $19.80 (Philadelphia); Capris In Motion, $17 (Flamboro); Albert Town, $29 (Flamboro); Mystery Exposed, $18.20 (Balmoral); Dave’s Bid, $21.40 (Balmoral); Rathbone N, $20.60 (Balmoral); Four Starzz Kid, $7.20 (Balmoral); Rexasauris, $14.20 (Philadelphia); Palm’s Beach, $15.60 (Philadelphia); One More Ginny, $11.40 (Mohawk); Whiskey Tax, $37 (Mohawk). Get onto our mailing list. Soon we will be offering ways to learn more about playing for profit. Enter your email for free by clicking here. Check our Balmoral weekend Pick-4-and-win picks at the USTA’s Strategic Wagering Program page and peruse other various topics on harness racing at my Hoof Beats blog titled Vast Performances. On June 6 Running Aces Harness Park opens its 2012 season. Qualifying races were held recently, offering the prospect that horses owned by the Van Otterloo Stable are ready to fly. Team Otterloo sent out five winners on the qually card, including Chewy Baca, Plum Crazy Baby, Oompa Loompa, I O One and Al Mar Peggy Sue, the latter the only trotter of the quintet. World Champion Sweet Lou trounced his competition in a $281,335 Pennsylvania Sires Stake at the Meadows. He is now poised to take control in one of next week’s North America Cup eliminations in Canada. Dave Palone once again piloted Sweet Lou and regardless of heavy rains making the track sloppy and a flat tire on his sulky just before the start of the race, he flew over the slop to score by 5 lengths in 1:50.3. In September of 2011, the connections of millionaire-pacer Hypnotic Blue Chip (pictured left) retired the older pacer. Things change. Hypnotic Blue Chip has been brought back for another season and won his qualifier readying to meet his older foes again. He is a winner of $1.5 million for trainer Kevin McDermott. The Fall Final Four, a season’s stakes quartet for two-year-olds, do not appear on the North American stakes schedule. The races—the Governor’s Cup (pacing colts), the Three Diamonds (pacing fillies), the Valley Victory (trotting colts) and the Goldsmith Maid (trotting fillies) had been staged at Chester (now Philadelphia) last November and carried purses from $365,000 for the Goldsmith Maid to $501,000 for the Governor’s Cup. Prior to being presented at Philadelphia, the Fall Final Four events were raced at either the Meadowlands, Woodbine or Mohawk. They began as features at the ill-fated Garden State Park. 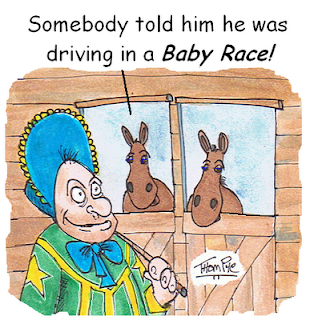 Have you noticed the variety of sulkies being used these days at harness tracks everywhere? The most popular new bikes are the Spider Sulky and the UFO, both sporting customized wheels that spin spoke designs. The new sulkies do not offer any advantage to handicappers; they are simply stylized gear. 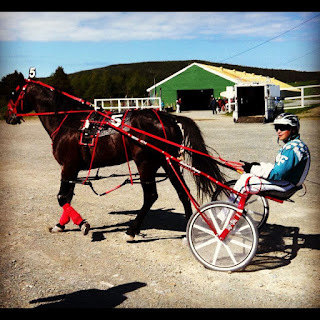 Recently, driver Tim Tetrick became the youngest man in the sport’s history to win 7,000 harness races. He marked the achievement at Philadelphia. The 30-year-old Tetrick made better on Walter Case, Jr. who was the youngest driver to reach the milestone at 35. Tetrick, who brought his tack east from Illinois already holds the records for youngest driver to win 3,000, 4,000, 5,000 and 6,000 races. He also was the youngest to reach $100 million in career purses. Watch the Hambletonian Trail blog for previews and the Hambletonian Society website for result stories. I can learn here so many useful things! I am happy to discover your blog. Good job!